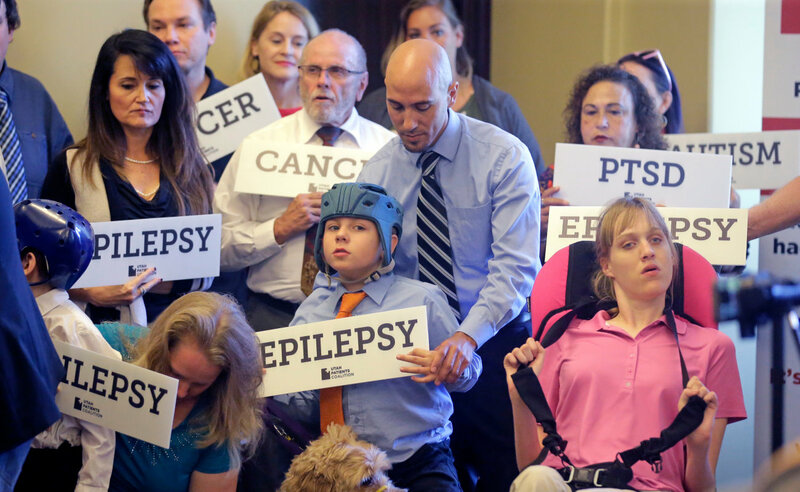 ST. GEORGE — Leaders of The Church of Jesus Christ of Latter-day Saints are calling on the Utah Legislature to legalize medical marijuana on a broader scale than the state currently allows by year’s end. While the church has stated its support of medical marijuana use, it nonetheless continues to encourage Utahns to vote against the ballot measure known as Proposition 2. LDS representatives told the Deseret News Sunday they want the Legislature to pass medical marijuana legalization so patients who have medical needs that can benefit from legal marijuana-based medication don’t have to keep waiting. “This isn’t ‘let’s wait till next year to have a conversation.’ It needs to be dealt with soon. There’s an urgency to accomplish this,” said Jack Gerard, a leader in the LDS church. The church, along with other groups who each belong to the anti-Proposition 2 coalition Drug Safe Utah, considers the ballot measure to be too broad and potential harmful to the state’s youth. Proposition 2 would create a state-regulated growing and dispensing operation to allow people with certain medical conditions to get medical marijuana cards and use the drug in edible forms, lotions or electronic cigarettes. Regular smoking of marijuana is prohibited under the ballot measure. Opponents also take issue with Proposition 2 allowing someone to grow their own marijuana if they live more than 100 miles from a designated dispensary. 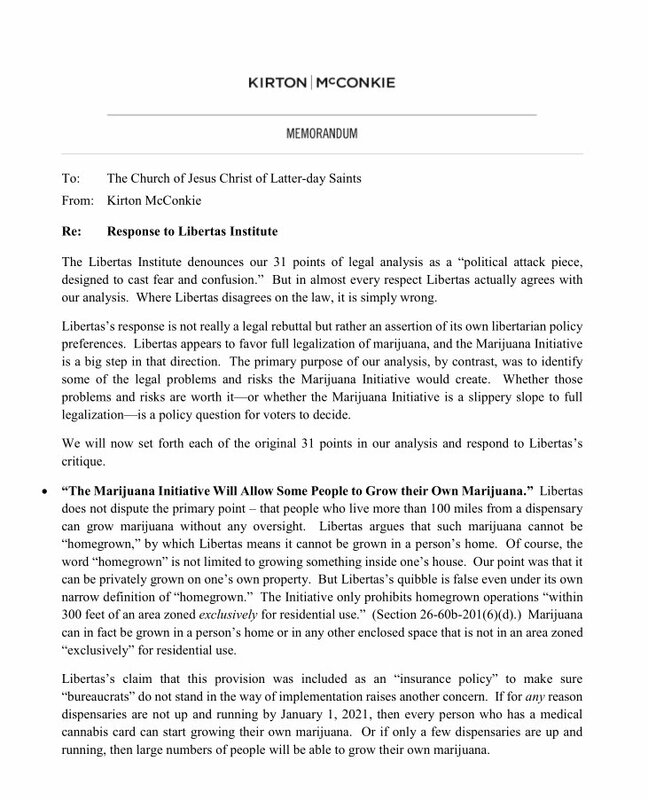 The Kirton McConkie response to the Libertas Institute’s original rebuttal to a legal analysis the law firm did for the LDS church concerning Proposition 2 | Click the image to access the PDF of the rebuttal. These points were reinforced Monday in a new document released by the Kirton McConkie law firm in response to a counterpoints the libertarian-leaning think tank Libertas Institute made against a legal analysis the firm originally did for the church in May. A counterpoint to a counterpoint, the document goes on the claim the Libertas Institute actually agrees with many of the points of the original analysis, yet interprets those points differently. “This latest memo is 11th-hour nit-picking that shows more obstructionism to a proposal that’s been public for well over a year,” Conner Boyack, Libertas Institute president, told St. George in a statement Monday. “The public is ready to vote on Prop 2, and nuanced legal arguments taken out of context aren’t going to change anybody’s mind,” he said. The Libertas Institute is a major backer of Proposition 2 which was originally brought forward by the Utah Patients Coalition last summer. Proposition 2 supporters have said the ballot initiative was an answer to the Legislature’s failure to pass board medical marijuana legalization. To say the Legislature hasn’t passed anything is unfair and untrue, state Sen. Don Ipson, R-St. George, said Monday. In 2014 the Legislature passed a law allowing the use of CBD-based cannabis oils for the treatment of epilepsy. Earlier this year lawmakers also passed a “right to try” bill that gave terminal ill patients the ability to try cannabis-based medicines. “I think we created a good bridge” that will help lead into better laws, Ipson said. Ipson does not support Proposition 2. Ipson also said he supports the idea of calling a special legislative session to hammer out some kind of legislative answer to Proposition 2. Well, it’s a done deal now that the REAL government of Utah has spoken. How does Utah even keep it’s status as a US State? It’s the friggin’ People’s Brainwashed Theocracy of Utah around here. Well, it’s a done deal now that the REAL government of Utah has spoken. How does Utah even keep it’s status as a US State? Praise THE LORD! THE LORD has spoken to our beloved prophet and the issue has been settled! Although it is not out of the woods, this is the best PR the Church of Later Day Saints has gotten since that Broadway theatrical hit a few years back. People that smoke recreationally are going to do it anyway. BUT this is for those that NEED IT from a medical standpoint. I see this as a deal breaker. Wow, finally commonsense prevails. Here is a crazy idea. Think for yourself. Just a thought. some people should follow their own advice ! Some people should learn that even as an adult they appear childish. Oh my! How can anyone deny that the LDS church runs the stste. Do you ever say anything constructive or even worthwhile? Maybe time for you to take a break from the comments, Mr. Strikeout. Classy. Reply by mimicking. Are you 12 or 13? Any individual or group can ask lawmakers to do anything. That doesn’t make it so. The LDS church is expressing their opinion on this, which they’re entitled to. Libertas Institute and Utah Patients Coalition are doing the same thing, which they’re entitled to. Elected representatives will ultimately make the call. That’s how a republic works. “That doesn’t make it so.” LOL, in the case of the “LDS church”, (btw Brian, that moniker is no longer acceptable according to church authorities) it most certainly does make it so. Cite me a single example where the church issued their opinion and the legislature did not comply. You never fail to be this forum’s chief apologist for the Mormon church. Why don’t you cite the exact bills that were passed with direct evidence the church told legislators to follow the will of the church or else? You have to back up your claims. Brian doesn’t have to prove a negative. You are making an assertion that the church runs the state. Prove it by providing direct evidence that the church dictates to legislators that they must fall in line. Brian, I know full well you’re not this much of a clueless doof. You are a member also, and you know our church calls the shots in UT. Did a poll tell the church Prop two would pass? Ok, 2+2 = 4. LDS Church has and uses influence to control political outcomes. Nothing new here folks. 2+3 =5 LDS Church is largest group in Utah. 3+4 =7. By default LDS Church has substantial control of Utah political sphere. Nothing evil here, this is how the political system works. No reason to deny this. Now, not an expert on LDS Church, but based on what I have read, their appointed Prophet or highest leader has the final decision. Perhaps council of 12 has influence or a say, but their leader is the DECIDER. 5+4 =9. By default this leader is the most powerful political force in Utah. Now you can argue this is not true, but it is clear from a political standpoint the LDS Church operates in tbe same manner as a corporation. They have lobbyists, they contribute $$$ , and can use members as proxys, such as the guy that filed the lawsuit against this proposition. In theory our country is based on a separation of Church and State. Since politics can be gamed, the statement Utah is controlled by a single group has validity. So to all you Mormon posters above in denial, just own it. 5+5 = 10. You did the math, Comments. Dont we all know that each and every Mormon is a free agent, free to do exactly as their bishop dictates. LDS rules in Utah.